I am still feeling good and strong after more than a week on the trail. 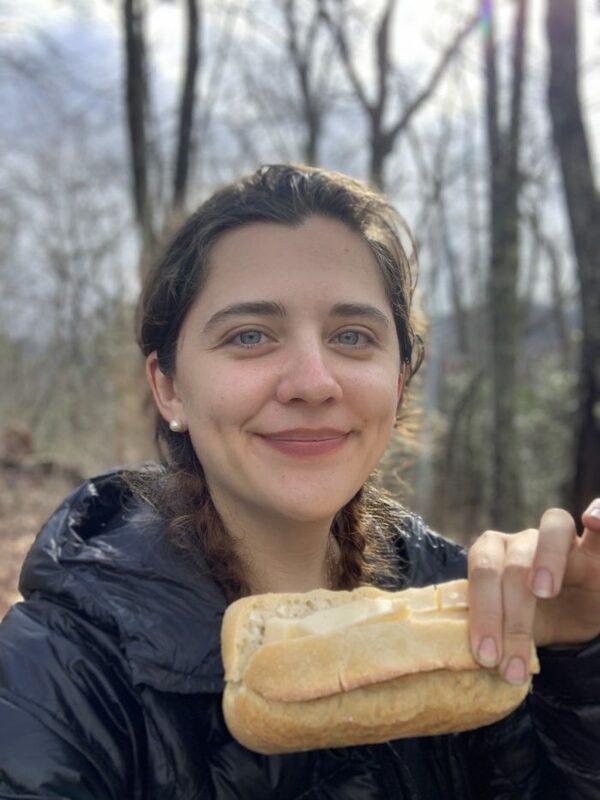 Here are my most recent trail notes, and at the end, I’ve listed some mistakes, things which surprised me, and how I stay occupied while hiking. We ended up squishing eight people into our cabin so everyone could get a shower and a night’s sleep inside. Amazing how simple things like hot water and being able to fill up bottles in the stove can perk you up! To make up for the shorter day over Blood Mountain, I went 11.5 miles to Low Gap Shelter. The weather was gorgeous—70 degrees and sunny—and I had to slather on sunscreen during my snack break (a little too late as I woke up pink). The hike to Low Gap was much hillier than I had expected. Lots of up and down sections (also called pointless ups and downs or PUDs), and I kept thinking I’d climbed each mountain only to see three more peaks ahead. I did feel like I was getting more into my hiking stride, and I didn’t need to stop often going uphill, just kept going slooooowly. At Low Gap Shelter I met two older gentlemen, one wearing a Trump hat (first political sign I’d seen on the trail, unless you count a “stop pollution, eat garbage” pack sticker). The other guy turned out to be from New York City, first fellow NYCer I’ve seen on the trail. They were handy and shared some tips from the shakedown one did at Mountain Crossings as well as better ways to stay warm sleeping at night. I also met two German women hiking together, who’d met on the Approach Trail and been hiking together since. One had never been to the US before, and the other briefly visited NYC, but they’re both enjoying the experience so far. I made it over 15 miles today and headed to Trey Mountain from Low Gap. I was nervous to camp up on Trey Mountain because we were meant to get a windy, rainy night, and it was my first real night camping in the rain. My tent has held up well so far, but the wind kept waking me up because it’s so loud and unpredictable. The afternoon brought amazing trail magic from SWAT (some kind of Georgia youth group), with a full buffet of hamburgers, hot dogs, snacks, water, cookies, and more. One of the girls kept looking at my pack, and apparently she was telling her friends she thought it would be cool to hike the AT. I let her and two other friends try on my backpack to see just how heavy things can be, and it was a bit more than they were expecting. They still seemed interested, though, and I got to sign the group’s hiking stick with my trail name. Much more original than a trail logbook. I had a tough time on some of the uphills and a few moments when I wished I didn’t need to keep on walking. I pushed through by deciding what soup I wanted for dinner and whether I’d have noodles or rice, which surprisingly kept me occupied for a while. My feet were swollen by the end of the day, but some Tiger Balm, foot roller, and rest helped. I discovered a clever way of tying up my umbrella with a bandana on my backpack strap, which meant a hands-free rain cover for my face. It seems like a small thing, but keeping the drops out of my eyes makes a big difference on the bad weather days, when I’m thinking about taking one more step and don’t want to to be distracted by weather. All of the guys I’d been hiking with went to Hiawassee for a night. I took a ride to the grocery store to get bread and cheese but didn’t feel smelly enough for a shower and laundry, so I’ll probably run into them at another hiking town in the future. I camped about half a mile from town and was expecting to have my first night in the woods alone, but a few other hikers turned up later to keep me company. 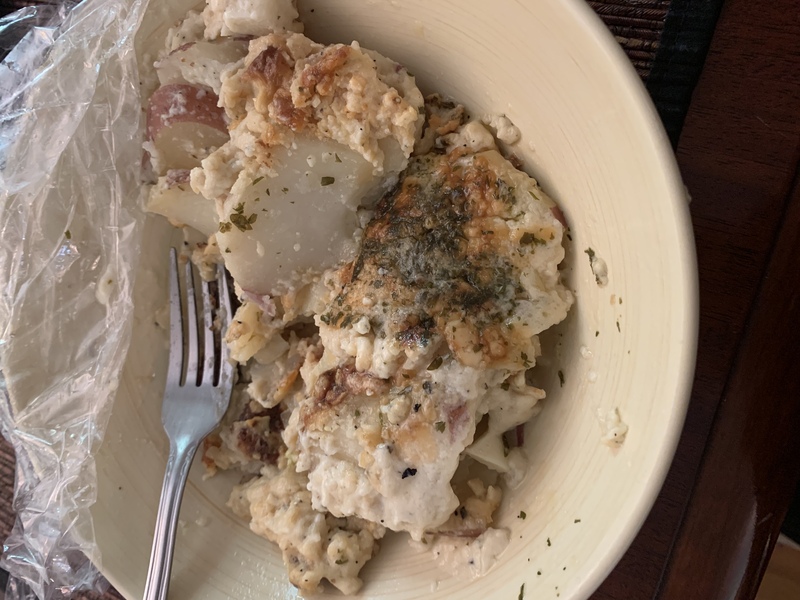 I had a good dinner with Shaggy, who hiked the PCT in 2017 and had the lightest bag (nine pounds without food and water) that I had seen yet on the trip. I had a big day today, pushing 16.3 miles from Hiawassee to Standing Indian Mountain. My feet were sore, but I wanted to hike on so I could get to Franklin in two days and then take a day off. There were lots of people at Standing Indian who had started a few days before me, so I felt good about my pace. One of my concerns has been falling behind and getting stuck in the giant bubble of hikers starting April 1 (70 registered, which is crazy). Not that I’m racing, but I would prefer to not be totally swamped at each shelter. I ran into amazing trail magic today from an extended family who’ve been providing breakfast and dinner for 17 years! One of the members hiked in 2002, and it made such an impression on him that he wanted to give back every year. I ate so much that I didn’t need to cook dinner; yay. Today I also crossed from Georgia to North Carolina. One state finished and 13 to go. There were a few moments when I felt rough about pushing on, because the mountains kept on coming, but I kept thinking about my first day off in Franklin and how that would make the climbs worth it. Today also marked my first full week on the trail, and given that I felt good and had no problems other than being tired, I felt accomplished when I packed up at night. 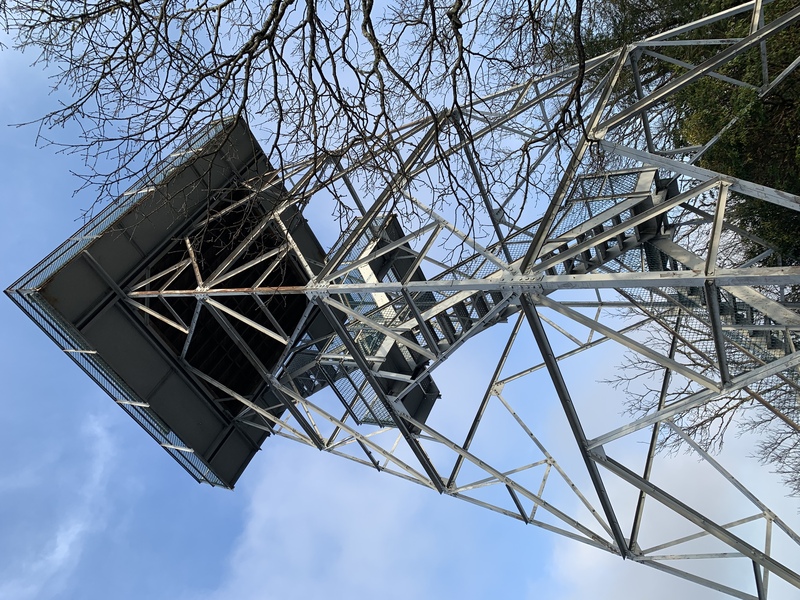 I had another hefty day heading from Standing Indian Mountain to the Albert Mountain fire tower, where I planned to camp for the night. Plus, that would leave me at mile 99.7, so I’d hit the 100-mile mark early the next morning. I ran into Zen, who runs the Gooder Grove Hostel in Franklin, right before my last climb of the day. I’d already made plans to stay with him for my day off, and it was great to meet in person (especially as he gave me some Doritos, fruit snacks, and soda). Everything I’d heard about him and his hostel was positive, and I’ve been enjoying the stay as I type up all my notes, call my family, and all that fun stuff you do with phone service. The day was generally easy with only one real climb, heading up Albert Mountain. For the first time on the trip I had to stow my trekking poles and use my hands to climb, because the rocks were so steep. Thankfully it was a short section. I took it slow and ended up feeling fine by the end, which wasn’t really a surprise as I’ve learned that I can accomplish a lot going step by step. It does still feel like I’m on a hiking trip and NOT that this is my life for another five plus months, so I expect that realization will hit after a few more weeks. The routine of setting up camp and taking camp down every night is getting a bit annoying, so I am trying to think of some things I can mail home to lighten the load and the banality of it all. But on the other hand, part of me realizes it’s probably good to spend time doing these boring everyday things and making peace with it, because it’s good for me overall to get more comfortable with tedious chores and to find the joy in them. I did manage to get a spot on the Albert Mountain fire shelter and was surprised no one else camped up top. In the afternoon, I met Jordan and another guy, and they had lots of great outdoors stories to tell me. All about climbing! It’s a special kind of person who likes coming out here, and I’m happy to be meeting so many of them. We had a picnic with dark chocolate, wine, sausage, trail mix, and other odds and ends. 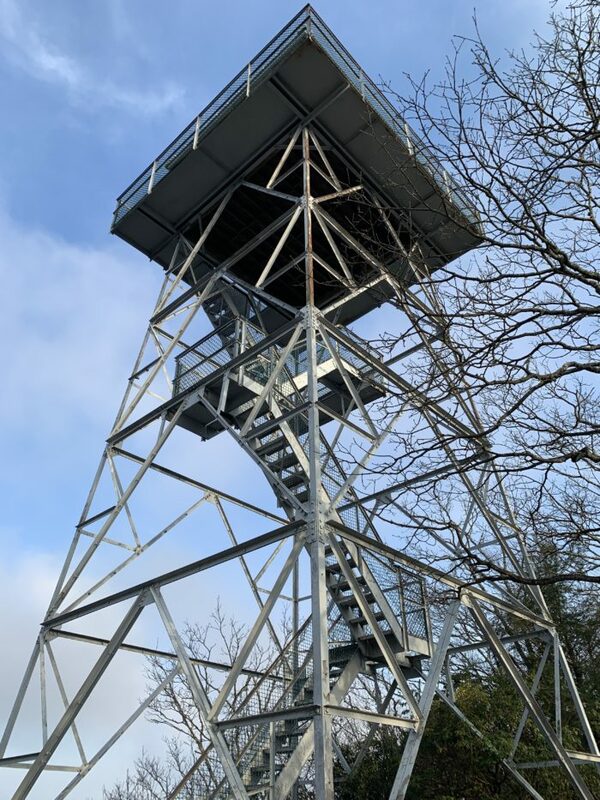 The wind turned out to be fierce overnight, but the fire tower was cozy. 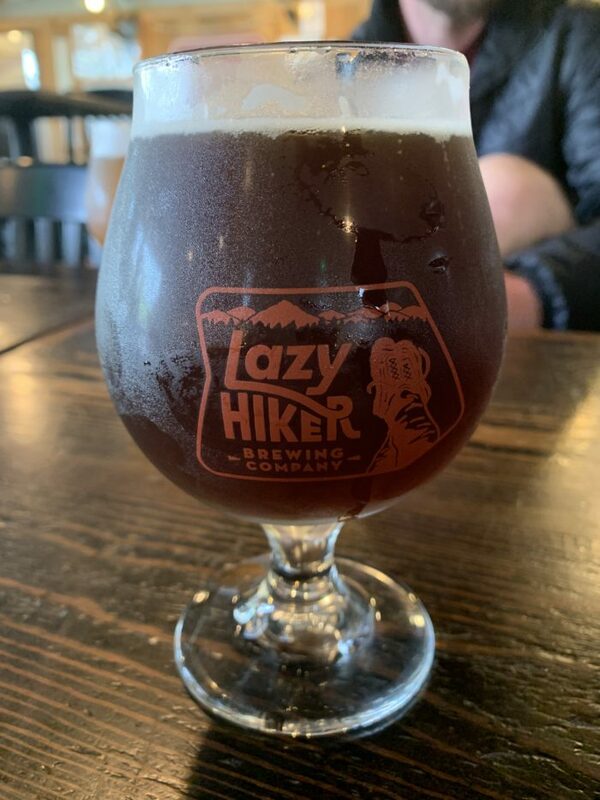 It was lovely to wake up and realize that I had only ten miles to cover today, and that I could spend the night in town, take the next day off, and hit up Lazy Hiker Brewing and put my feet up. I spent nearly the whole day practicing my weird millennial mindfulness activity, which is singing Country Roads to myself, but every time I get distracted, I have to start over from the beginning. In the entire day, I think I made it to the end once? Too many plants, distractions, and pesky thoughts about uphills and downhills to distract. And just to be clear, given my pack weight and the sternum strap, when I say “sing,” I mean “half sing and half smothered whisper the high bits,” which is another reason I usually hike by myself. Sometimes I listen to podcasts or books, but I like taking hours off of electronics to think and to let my mind wander. Once I’d exhausted the singing, I spent a long time thinking about life and priorities, and whether I’ll have the mental fortitude after my hike to write about it more seriously (hoping so). One word at a time, just as I’m taking a step at a time now. 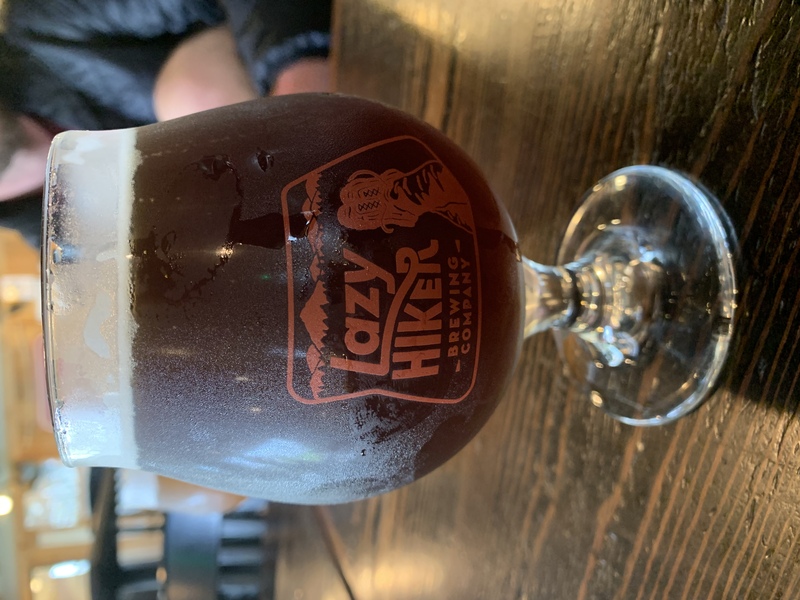 After checking into the Gooder Grove Hostel, having an amazing shower, and putting together a creative loaner clothes outfit of scrubs and a giant button-down so I could do laundry, I headed to Lazy Hiker Brewing with about six other people to enjoy a beer and relax. Good talks all around. 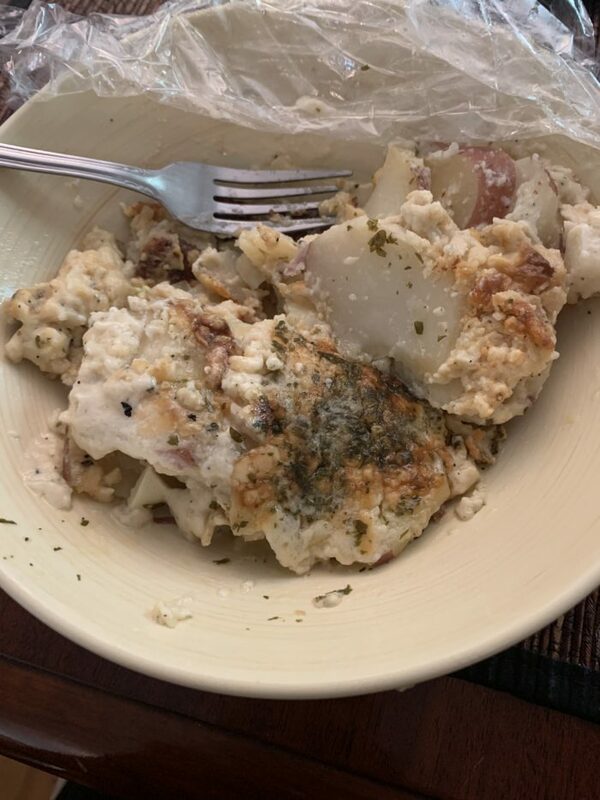 For dinner, Pixie and Deadfall made a delicious meal of chicken, carrots, and scalloped potatoes: exactly what I needed for my first day off. Leaving my socks on the shelter porch, where two blew away on my first rainy night. I easily recovered them but had to spend a few hours cleaning off the mud and drying them. Waking up too early and deciding to make breakfast, but not realizing that the clear plastic bowl, which fit perfectly onto the bottom of my pot, was STILL ON MY POT when I put it onto my stove. Spent a second thinking, “Wow, what a huge flame, how odd” before realizing my bowl had totally melted. Whoops. The trail is so loud! Mainly the wind at night, which rushes through the trees, and the rain on my tent. The trees also make a creepy creaking sound (just like a rusty old door) when it’s extremely windy, which woke me up a few times. There are not as many white blazes as I expected, and there have been several sections where I needed to double back to make sure I was walking in the right direction. My hiker hunger hasn’t kicked in! I keep having too much to eat and a heavy, heavy food bag. There is no downtime. I wake up, pack up, hike, set up camp, and sleep. I notice a lot of people listening to music, books, and podcasts on the trail. I occasionally do a nice audiobook or podcast on rainy mornings when I need the motivation, but mostly I have been enjoying the nature around me. On the tough uphills, there is absolutely no extra brain space for me to distract myself with media, as I need to focus on taking one more step. Maybe that will change as my trail legs kick in? Right now I’m looking forward to a food box in the next town and then will be hitting the Smoky Mountains. This is fab- really enjoying reading your progress and trying to learn from your mistakes! Love reading this. Will make a great book Kat. Keep writing and walking. Looking forward to the next chapters. Love you. Really enjoying your thoughts on the AT. I’m almost twice your age and only have wondered what it would be like. Keep it up missy and adventure on! I’m really inspired by the life lessons you are sharing with us while hiking the trail. May you continue to move one step at a time in peace and free from afflictions. I enjoyed reading your post-intersting and entertaining . I am so glad you are not like some hikers who are always hiking with their ears plugged up listening to who knows what. Hearing the sounds of nature around you is an important part of your journey. Those who don’t listen to nature are missing a lot. Happy hiking and maybe I will see you on the trail. I do maintenance on an AT portion in the Smokies and will be doing trail magic again soon. Look forward to your posts. Look for an old white haired female who loves the hiking community. It is a pleasure to read such a delightful, well written, informative, and introspective journal. I look forward to following you all the way to Maine. Great to follow your Journey. I’m hoping to hike some or all of it next year. Not only well written but it reads so darn well. Bet I am not the first to tell you that. Have a feeling Wallace Stegner, Carrot Quinn, and Edward Abbey would feel the same way. Just to name few. Thanks and looking forward to your next! Great post! I’ll be hitting the trail NOBO in Harper’s Ferry as a flip flopper in May. I’ve enjoyed living through you leading up to it. Hope to see you out there! Enjoying your posts. Hope you don’t mind my following along on your journey. Good to read other people’s experiences of their hikes! Glad you’re doing so well! See you out there.